As told in the excellent book A Whack On The Side Of The Head by Roger von Oech, a few centuries back there was a plague in a small village that caused people to go into a death-like coma. Most of them eventually died, but occasionally someone would be mistaken for dead and accidentally buried alive. I thought the story was over. The shelves were built and I walked off slowly into the sunset. However, sometimes you can’t predict the future. 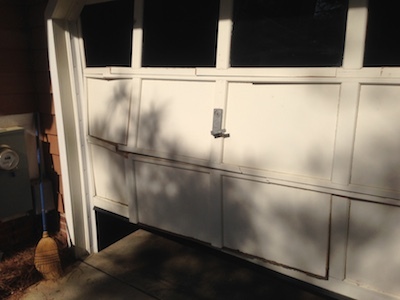 There was an unfortunate incident that caused both garage doors to need to be replaced. One of the garage doors came in contact with a minivan. We may never know who moved first, but suffice it to say, mistakes were made and the garage door paid the ultimate price.